With Regal Ravioli moving south and Monarch Food Mart seemingly content with its '22 territory, East Side King's making a play for total '02 sovereignty. 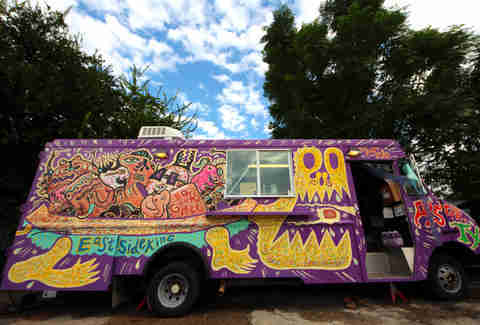 The eye-catching trailer -- painted by Japanese cosmic punk Peelander Yellow -- now offers a restaurant-sized menu inspired by Paul Qui and Moto Utsunomiya's latest trip to the Far East, where the Top Chef met a ton of top chefs. 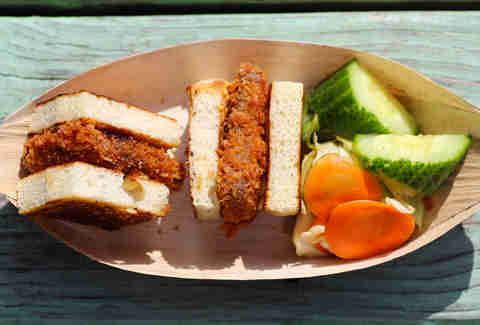 The new offerings are based on lower-class street food called BQ Gourmet, with brioche sandos like the Katsu or Gyu Tongue (panko-fried pork belly or beef tongue, w/ kewpie mayo & karashi mustard), foie with chili apple jam & almond butter, and chicken liver with yellow onion, bacon, and black pepper tare BBQ sauce, which is worth its weight in however much weight it causes you to gain. You can also skip the bread and go for don rice bowls (East Side Don King? 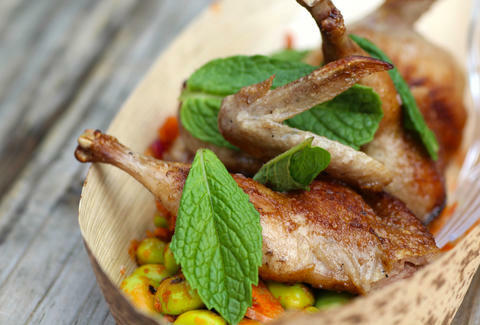 ), grilled quail with roasted edamame and shrimp paste, dry-rubbed beef rib with horseradish aioli, and a for-sharing pork shoulder with yellow onion, herbs, and fermented black beans called "douch", perhaps the most sanitary of all legumes. Smaller bar bites count a Japanese take on chips-and-salsa made with deep-fried rice cakes, seaweed, and ponzu. Of course all of this might be risky for tentative taste buds, so the question is, do you feel lucky, cosmic punk?